Our product range includes a wide range of vibrating machine. 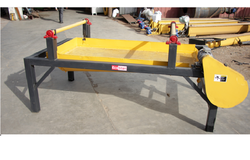 Our product line comprises of an extensive range of Vibrating Machine. We offer a huge variety of Vibrating Machines. This consists of a net wire which always flutters at the time of working of plant and raw material is quarantined to liberate it from all kinds of substantial fragments of wood, any iron, nails or sturdy materials are not advisable for making Briquettes. This machine is particularly appreciated because of its strong creation and longer provider life. Moreover, this range is to be had in unique specs which are supplied in standard and custom design spec at prevailing market prices.